Club Penguin Cheats by Mimo777 Club Penguin Cheats by Mimo777: Club Penguin Amazing Snow Maze Coming Soon! It will be called the Great Snow Maze! I love mazes. We will see how fun this is! As we reported earlier this week, it will be here November 27-29 at the Ski Village. There will be new snow gear and other sweet surprises, probably for members. Have you ever been to a corn maze? I hear they are super fun! More coin and Club Penguin memberships give aways soon! Yeah, I said CLUB PENGUIN MEMBERSHIP 6 MONTH MEMBERSHIP! oh cool! corn mazes! i love those and you have a tasty snack every where you go! jk :D lol. the tootsville party yesterday was so fun! you added me and snowcone added me too. Sweet! I think it's really cool that club penguin has done that! i cant wait till the mod shake up! i might be a legendary mod! kewl. I hope that all the mimo mods become MEGA MIMO MODS (dun dun dun)! Cool a snow maze! I have been to a corn maze before. Once you get older they get more boring because you know there is a way to get out. awww cool mimo! I've neever been in a corn maze, but i think i passed one on the highway going to Georgia! Clubpenguin HAS to something for members! Disney made clubpenguin better! i love corn maizes, but sometimes i cant be bothered finishing so i cut though the corn, and because i live in NZ it is almost time that they opened again. Thats awesome Mimo! I am a member and I will love the game. I fell bad 4 the penguins that are not members though... It would be nice 2 let penguins that are not members be members 4 1 day. Hope you could us that idea 1 day! Peace! Your kinda right, but it's not like that boring. Look for membership contests if you don't want to pay. Those help you a lot cuz they're free. They are really fun even just looking at them is fun. Yeah ive been to a corn maze with a map and i navagated it perfectly lol sooo mod shake up later cool. mimo plz make me a mod i've been tryin'! Sounds Cool huh! I can't wait! Cool! I live in NZ too, can you wait till the Snow Maze Party Comes Out? I love the look of this maze!And I am luckily a member and it rocks!I hate non-members who constantly complain about CP doing to much member stuff!I mean...what do you expect?They have to make money! I went to a corn maze a few times. I didn't go this year because of all the rain I got killed the corn. Can't wait for the snow maze! You rock, Mimo! dun dun dun is right! But i think there is only 1 mega mimo mod! I bet at the most i will be a mod becuz i can only go on on weekends. GO MOD SHAKE UP! You r totally right. Games should be for everyone. But since we are in e recession everybody needs money. I think mimo is sad too becuz he isnt a member. 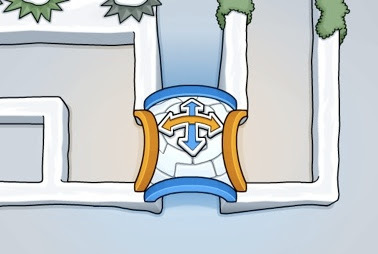 At the Club Penguin Homepage, now all the penguins there have blsck ninja belts and ninja masks! Also near the lighthouse in the Homepage, there is a hot sauce thing, like the type they use in card-jitsu. If you click on it a ninja apears, looks around, then takes it. Theres even a black puffle, and if you click on that the puffle turns into flames and flies around the screen! Sweet I totally can't wait! I LOVE MAZES! And plus I don't get how you are so bothered by Member stuff! They are trying to make money! hey mimo just wondering if we become mimo mod and u add us, if we ever quit modding will u delete us? I am with ya on that. So do you think cp is making more money or less money becuz they r turning off non members. Do you think people are that gullible? cp HAS to make money somehow! its really unfair but they need a living! i feel the same way sometimes, but its just impossible not to make members have special things! Thats a good idea! non members should be members for a day, or mayb a week! I have been hearing that Club penguin is boring all over. I miss the old Club Penguin too, but i have learned to love the new one. I hope my little peice of advice Could help you. I think it is really cool that they did that 2, but I feel bad for the penguins that are not members. Don't you think that they should at least give none members a day of membership? Think about it. O NO! i diddent know that this game would be for members only :( i thought you were giving a membership away. Mimo, i think we should have a non-member only party. I've been a non-member ever since club penguin opened. Ill let the clothes slide, but games should be for everyone!! mimo will there b any comps 2 win a limited edition plush toy because i won 1 of them with a gold viking helmet 1 please post one soon! MIMO!u know on the home page? instead of a spy phone its hot sauce and when u click on it its a ninja instead of an agent!!!! I know what you mean. You are not a member, am i right? I think that is game should be 4 any penguin on Club Penguin. Some penguins disagree with me but it's ok. Penguin, a.k.a people, have different openions, thats ok. I hope you get what I'm saying... Waddle On! Ugh! I SOOOOO wanna be a MIMO MOD and have Mimo add me, but I'm busy with my own blog! Is there any other way to get Mimo to add me? I do agree, CP does do a TON for members, but that's because they need money! If non-members got the same privilages as Members, No one would buy a Membership! And you REALLY miss Penguin Chat 3? It seems like everyone does! I wish they'd keep it up just so I could see it! But I wouldn't blame Disney! Even rsnail agrees they made PC3 better! Actually now your a mimo mod. Congrats! I know! i just noticed it and i love it! Now i dont have to be a twitter member to see mimos twitters. Well i doubt that cp would ever have a nonmember only party since their money comes from members but you are right that games should be for everyone. I love corn mazes! They're so fun! Sweet Membas Only! I love corn mazes too! I live in Ohio, and there are a few corn mazes where I live, but not much; I've only been to one in my life! Im a member, but I definitly think that they are doing to much for members! I hate how there coming out with soo much more for members only. It mostly started when Disney took over. mimo's never been to a corn maze?!!! Wow, you haven't lived til you've been in a corn maze. Oh, I like the Pinapple maze if you've eva been there. It's like a real maze where the bushes (walls) are higher than 6 foot. Btw great job on being a mod. Games are ment for everyone aren't they? It's not fair to have a member-only game, I was fine with all the member stuff but now I hate it! Clubpenguin bosses, get your brains working, it's not fair. Awesome a maze! TO COOL! PLUS THE NEW CLOTHES AND EQUITMENT! Sure Clubpenguin needs money, but for one thing the member cost is way too high. One month should be three dollars. 6 months should be twenty. A year should be thirty five. And they are doing too much stuff for members. Don't you agree? I went to a corn maze just 2 weeks ago and it was AWESOME! So I bet a snow maze will be just as awesome lol.I can't wait! Awesome! I went in a corn maze, and other mazes, the day before Halloween. They were scary, but fun :D.
Yeh, i've been to a corn maze. They're so cool. Yea but re(member):) that on the screen when u log on to clubpenguin it says "A New Game Coming For Member Ninjas" so still but yea only a three day event! hi mimo! i never been to a corn maze, but i have been to an awsome PINEAPPLE maze it was so cool! Cool!!!! P.S HOW DO U CLONE?? It's really fun but when I went it was really muddy and me and my friend kept slipping over lol!! UVE NEVA BEN TO A CORN MAZE.OMG! What do ye do up there! In Tennessee,they also hav sunflower mazes. You're right! Games are ment for everyone! Mimo what would happen if someone kept on adding random questions then answering their own questions that they put as annoynamous and became a Mod? Shouldn't they get demoted? Other than being a family member? Probably not, you can make a really good family member or friend to become an admin and take care of your blog. Congrats Saavy!!! You're A MEGA MIMO MOD!!!!!! Keep up the AWESOME WORK!!! Please do not put (CPG MOD) after your name unless you are answering someone's question, correcting someone, congratulating new mods, or congratulating contest winners. Thank You. I've been in a corn maze! It was called the Maize maze (maize is a type of corn stuff). It was shaped as out national logo thingy-ma-bob! what the...? TOO MUCH MEMBER STUFF! IT'S AN OVERLOAD THIS IS WHY WEBOSAURS IS BETTER! ITS NOT FAIR! the old club penguin was better. lets overthrow disney. i miss the old cp too disney only wanted more money and they made 'good' changes, disney is ok.but they shouldnt have bought cp! waaaaa!!! it might be snow trekker!!!!! I don't like non members constantly complaining about the member stuff, its all we EVER talk about.Its not OUR prob. Also, you wouldn't be complaining if you were a member.